Maclovio James Lopez M.D., Ph.D. The Associate Chair for Clinical Services is involved in a variety of activities related to provision of clinical care with C. S. Mott Children's Hospital and communications with community physicians. Maclovio James Lopez, M.D., Ph.D., Associate Chair for Clinical Affairs, is a Professor of Pediatrics in the Division of Gastroenterology. Chris J. Dickinson, M.D. attended Wayne State University in Detroit, Michigan where he received a B.A. and M.D. degree. He then completed a General Pediatric Residency at Rainbow Babies and Children’s Hospital in Cleveland, Ohio followed by a Pediatric Gastroenterology Fellowship at the University of Michigan. 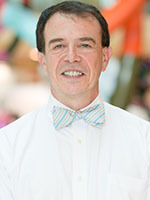 Dr. Dickinson became a faculty member in the Department of Pediatrics in July 1986 and served as the Chief of the division from July 1999 through June 2011. 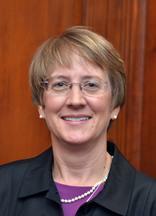 Dr. Dickinson was appointed as the Pediatric Associate Chief Medical Officer (PACMO) for the University of Michigan and C.S. Mott Children’s and Women’s Hospital in 2011. In this role he has focused on Patient Safety, Quality of Care, and New Initiatives in Mott Children's Hospital. His efforts include patient safety rounds on all the inpatient units, support for databases to accurately measure our quality of care, assisting the Associate Chair for Clinical Affairs in developing a meaningful peer review system for the department, and active participation in bed utilization during times of high census. Dr. Lumeng received her medical degree from the University of Michigan, where she also completed her pediatric residency. She completed fellowship at Boston University School of Medicine and is board certified in developmental and behavioral pediatrics. Dr. Lumeng does research on the development of children's eating behavior. As the Associate Chair for Research, she works with the Chair to oversee activities pertaining to the research goals of the Department. This includes developing and implementing research initiatives and mechanisms to ensure ongoing support for a growing research infrastructure, and leadership to the Pediatric Research Office (PRO) staff who provide support to Pediatric faculty for research funding, research compliance, and research facilities and equipment. The Associate Chair for Faculty Affairs primarily supervises, as a non-voting member, the Departmental Advisory Committee on Appointments and Promotions. The Chair is a member of the Faculty Mentoring Committee, which is devoted toward assuring sufficient supervision of junior faculty in the Instructional Track in terms of their progress in the laboratory. As needed, the Associate Chair participates in chairing faculty recruits at the Divisional level. The Pediatric Associate Chair for Faculty Affairs, Faye Silverstein M.D. is a Professor of Pediatric Neurology. The Department of Pediatrics has a strong commitment to diversity, equity and inclusion. We have developed a team of faculty and staff that organizes training programs, mentorship and activities to build a supportive and welcoming environment for faculty, trainees and staff. Along with Mott Hospital, we also have a strong presence at national meetings of organizations serving pediatrics in general with a specific focus on disadvantaged communities and under-represented in Medicine racial and ethnic groups. To stay in touch with alumni and friends around the country, we also host receptions at major national pediatric meetings. The Department also has a strong commitment to advocacy and frequent interactions with state and governmental officials and elected representatives. Programs throughout the year bring such officials to Ann Arbor to interface and exchange thoughts, ideas and information on children’s health. Through educational programs, both at the annual medical school alumni gathering, as well as several times during the year, we provide opportunities for pediatricians to stay up to date with developments and discoveries within our own department and maintain their knowledge and skills regarding a host of pediatric clinical issues. The Associate Chair for Diversity, Equity and Inclusion, and External and Governmental Affairs is Dr. Gary Freed. He is a general pediatrician and was the founding director of the Child Health Evaluation and Research (CHEAR) Center at the University of Michigan as well as the Director of the Division of General Pediatrics from 1998-2013. The Chief Department Administrator (CDA) manages the fiscal, administrative, and personnel activities within the Department of Pediatrics in partnership with the Chair. Total annual fiscal operations exceed $53M (clinical and research), and the CDA is expected to maintain the fiduciary integrity of the Department and identify, evaluate, and recommend improvements to existing operations. The CDA also has responsibility for the performance and operational effectiveness of the Department's 17 Divisions. Development and communication of the strategic plan/objectives for the department. Management of the departmental finances, budget/forecast, internal controls, and analysis. Enhancement of professional Revenue Cycle (pre-service and billing/collections) functions. New program development and external marketing (outreach) activities. Optimization of clinical operations and improved efficiency within patient care services. Development and professional growth of staff within the Divisions and Department. Terrill D. Bravender Jr, M.D. John J. Charpie, M.D., Ph.D.
M. James Lopez,, M.D., Ph.D.